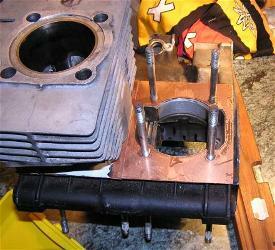 Mountig the 350cc cylinder on a 250cc engine the head studs can only be tighten 1.5 turns. 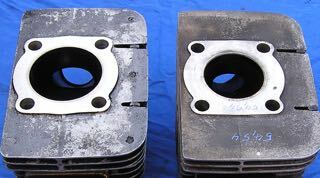 The 350cc cylinder is higher than the 250cc. The first idea was to use the longer bolts of RD350LC. These are 75.3 mm long, so 16 mm longer. 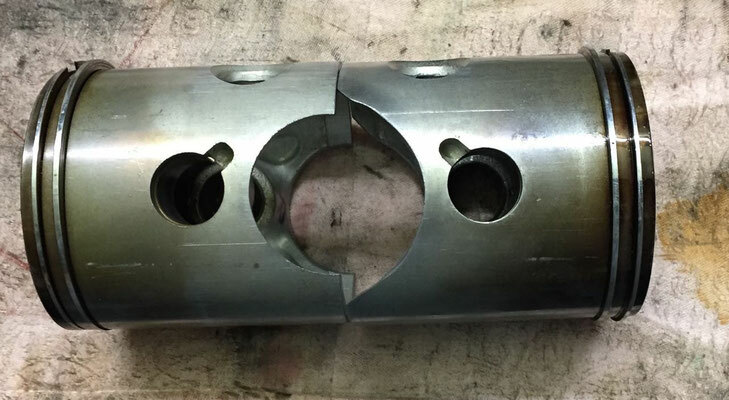 But now the bolt touches the bottom of the stud hole in the barrel. 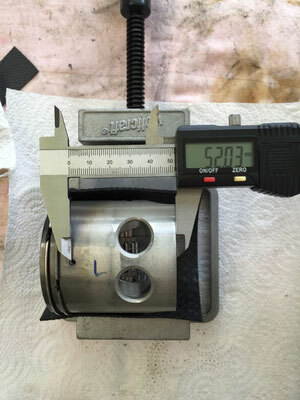 The hole is 38 mm deep and 13 mm diameter. 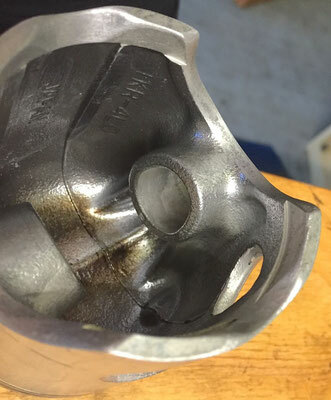 After that the bore is reduced to 9 mm. So take a 13 mm drill and drill the hole approximately 5 mm deeper. Now the bolt can be tighten 5 turns and that's enough. But the screws are still far too long. This can be balances by 5 thick washers. The needle bearing of the 350cc is wider than that of the 250cc. Unfortunately the YPVS bearing does not fit because they have a larger outer diameter. So you must find a RD350 air or R5 bearing. 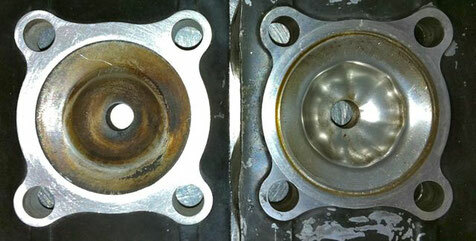 The oil pump transmission ratio of the 350cc is 12% higher than that of the 250cc. 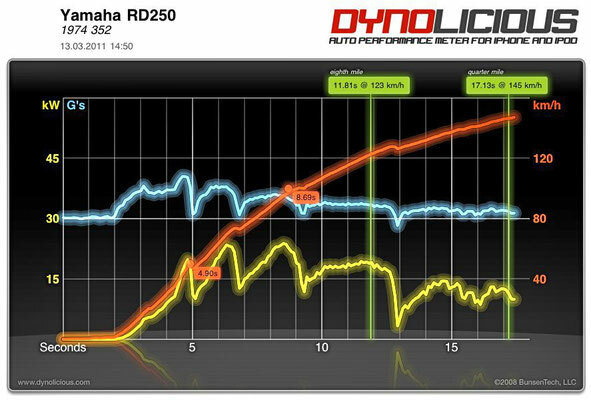 That's why the same pump delivers 12% more oil at the same speed and throttle position as 350cc. Assuming a mixing ratio 1:30 to 1:50 consequently missing 4.0 cc to 3.4 cc oil / liter of fuel. I solved the problem by mixing two-stroke oil into the tank. I take 40 cc oil together with 10 liters of fuel in the tank. 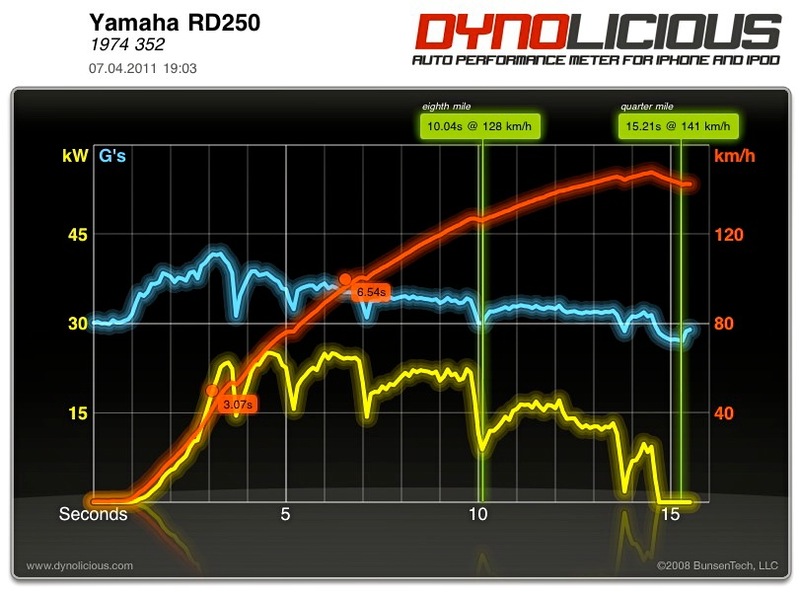 Incidentally, it is a mistake to assume that the RD350 needs more oil than the 250cc. For the same power the same amount of oil is needed. But the throttle is less wide open with the 350cc than the 250cc. It is almost impossible to get 350ziger heads that haven'd been changes already. Almost all have a reduced volume. 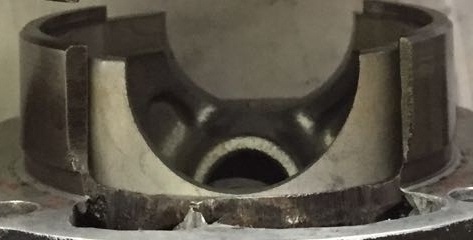 In my cylinder head collection of 10 or 12 heads, the edge height varies from 0.5 mm to 1,5 mm (see the blue lines in the picture below). 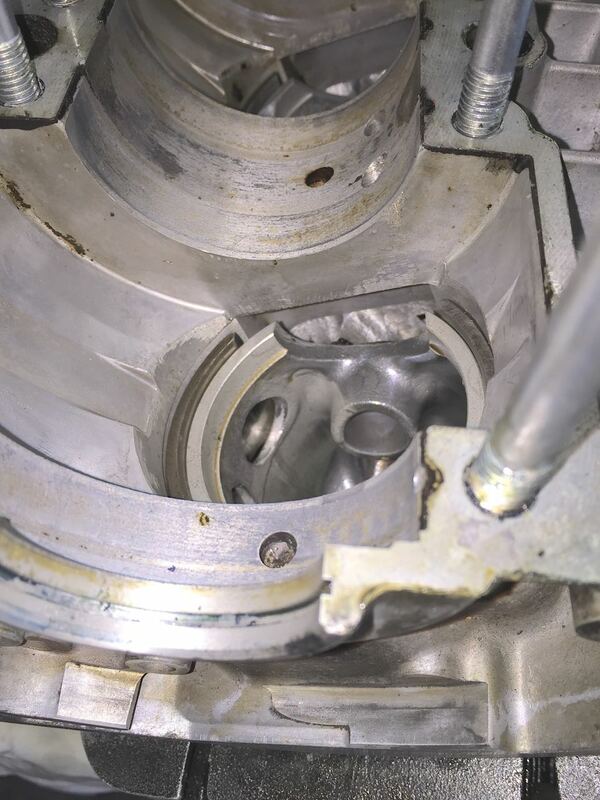 According to Yamaha technicians the 350cc cylinders and heads have never changed in height or squish gap. I suppose the 1.5mm edge is the original value. 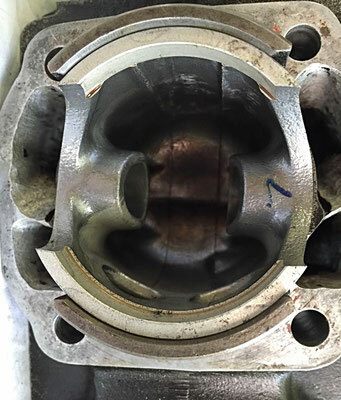 The squish gap in the standard cylinder and head with 1mm head gasket is 2.75 mm. This is much too large and the volume of Dome is much too small. 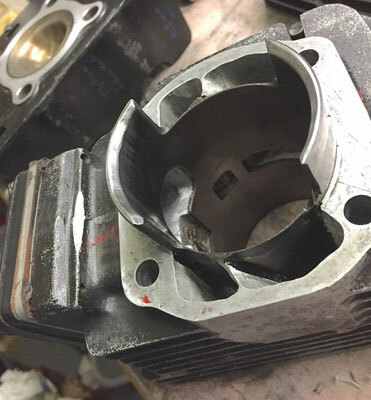 The original 350cc cylinder tend to knocking combustion. What is the squish gap? The squish gap is the minimum distance between the piston and the cylinder head on the side of the piston. 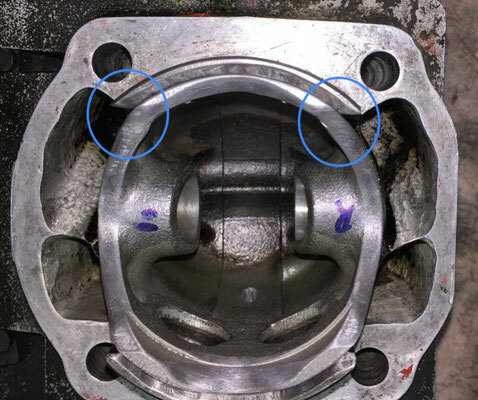 The squish gap is the sum of the edge in the head (see blue lines) the height of the cylinder head gasket and the distance of the piston at TDC to cylinder sealing surface. The squish gap can be measured in the assembled state 2 mm solder. Insert the wire through the spark plug hole until it touches the cylinder wall. 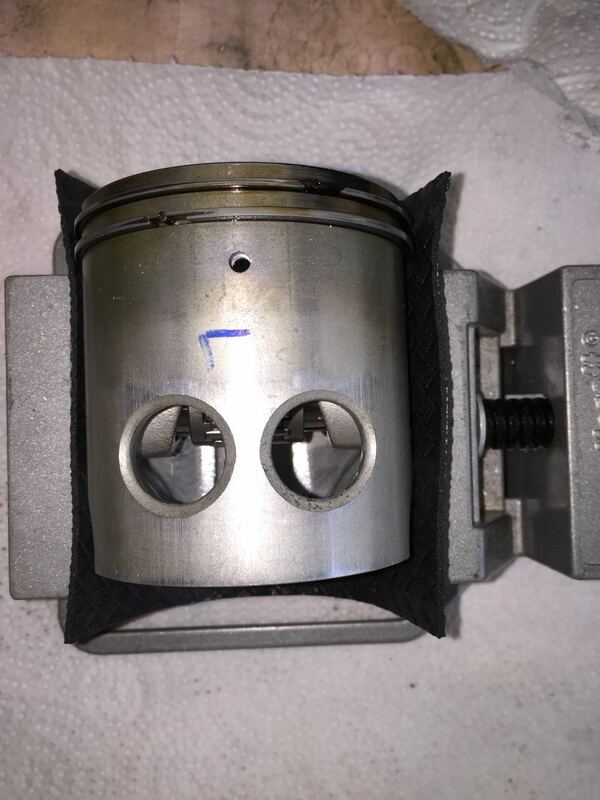 Then rotate the piston carefully through OT. Now you can read the squish with the measuring slid on the compress solder. Caution: You must be measured four times: On the inlet side, right and left and the outlet side. The squish gap can vary by 0.2 mm. With the air-cooled RD250 / 350 optimizing the combustion chamber shape brings more additional power than the machining of the channels and is also much less expensive and risky. 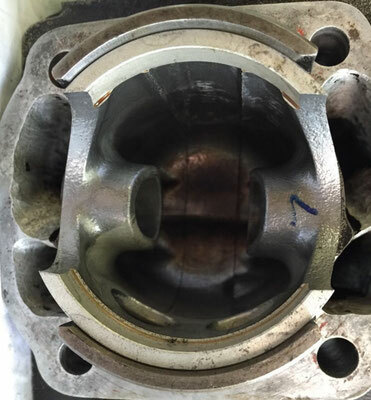 Decisive is the squish gap (distance between piston and cylinder head in OT at the outer edge) and the volume of the cylinder head. 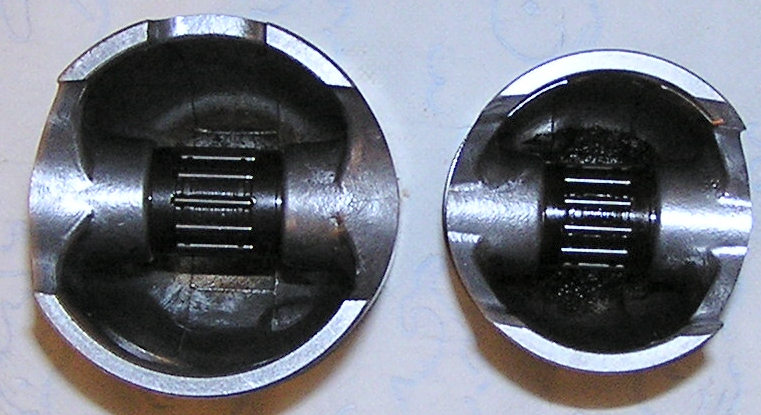 In the series, the squish gap is 2 mm (250cc) or 2.7mm (350cc). A distance of 0.7 mm to 1.3 mm would be optimal. In the sqish gap the combustion expires. The gas located there is lost and only generates heat instaed of power. In the 350 who make up 10%. At the same time offer piston and cylinder head in the area of the squish the hot combustion gas much surface on. 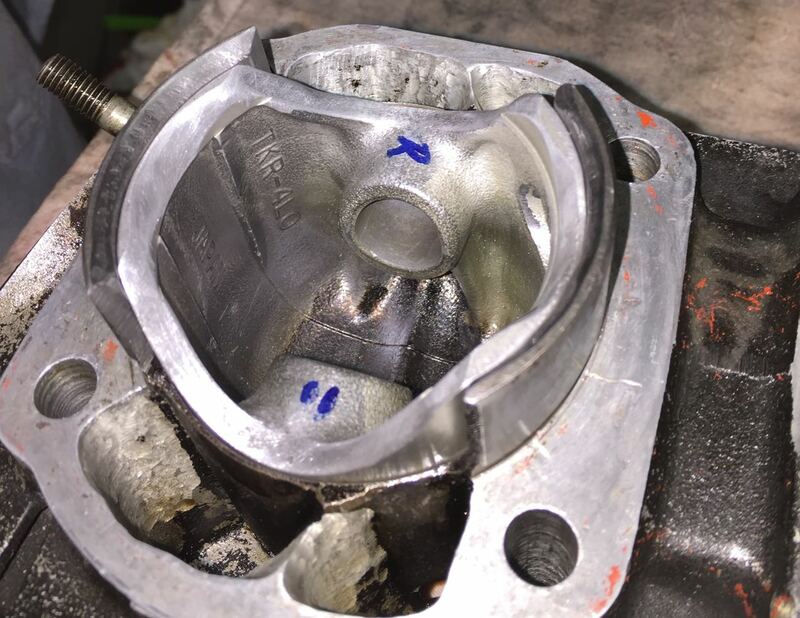 The less gas combusts in the gap the cooler head and piston stay. From 0.8 mm on the flame front goes out entirely. 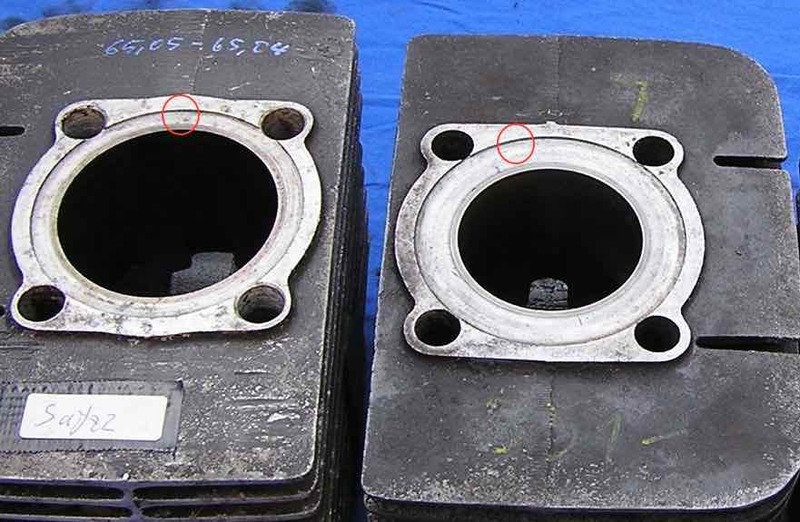 As a result knocking combustion is avoided, stability and performance goes up. 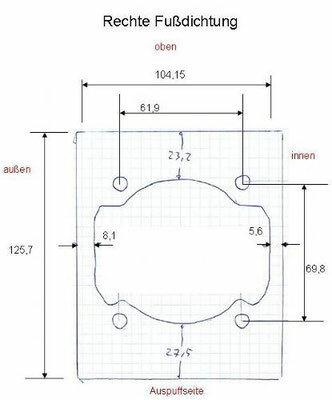 Plan the cylinder sealing surface until the edge (red circle below) disappears. 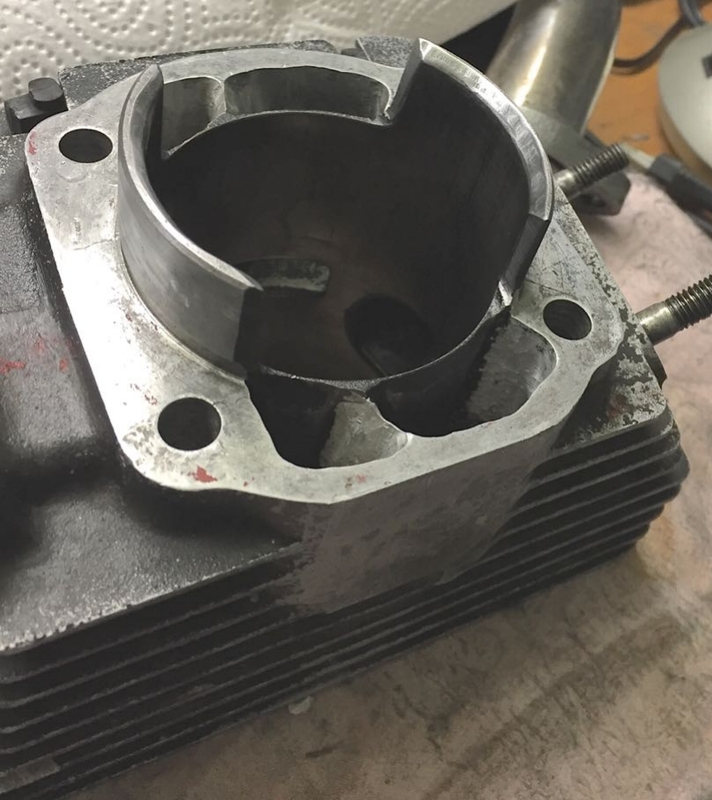 Then mount the cylinder head and measure squish gap. Plan the head until the edge in the head (top blue line) is zero. Assemble head and cylinder on the engine and measure the squish gap. Now increase the combustion dome by 5cc (from 15.5 cc to 22.5 cc pure head volume). Otherwise the engine is destroyed by knocking combustion. Note : The air-cooled runs after the head modification with ignition 18 degrees BTDC best. The compression is now 1:10.2. Standard was 1:9.77. But the engine knocks at partial at load as the original engine did. 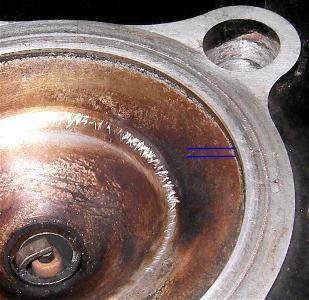 The following piston modification avoids this. Remedy creates a 3-5 mm hole in the piston drilled 6-10 mm below the bottom piston ring. 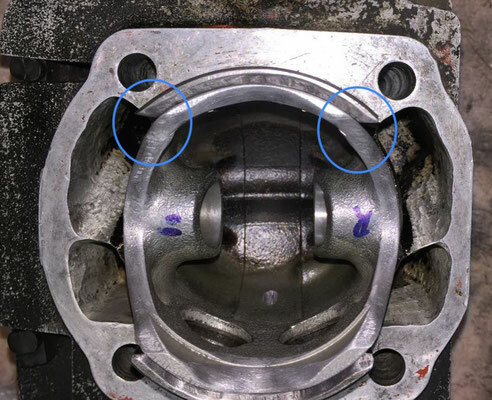 When looking into the piston, the hole must be far enough away from the piston base radius and the thickenings of the piston ring anti-rotation pins. 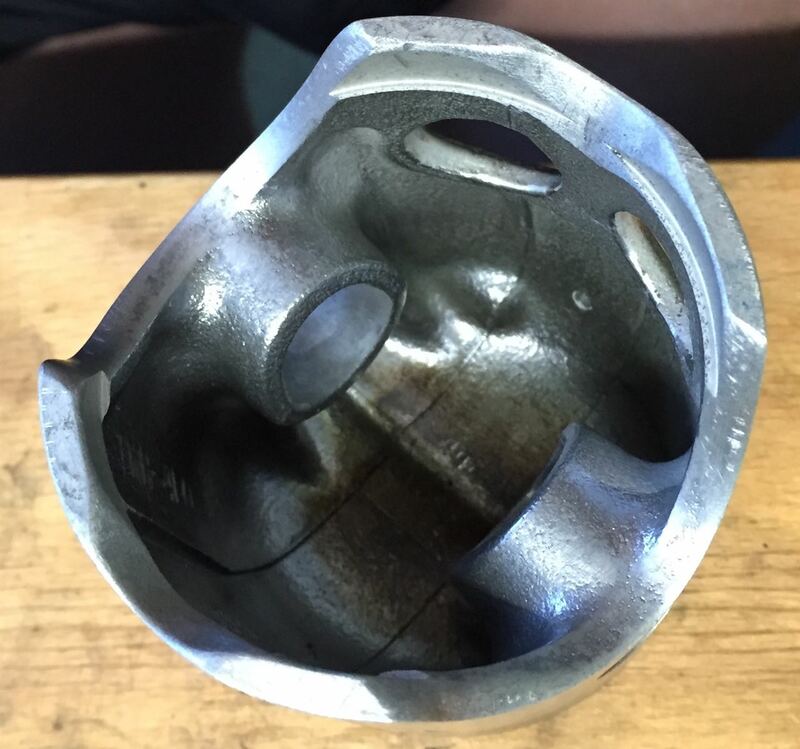 This can drain the hot air that accumulates above the piston pin. The impact is tremendous. 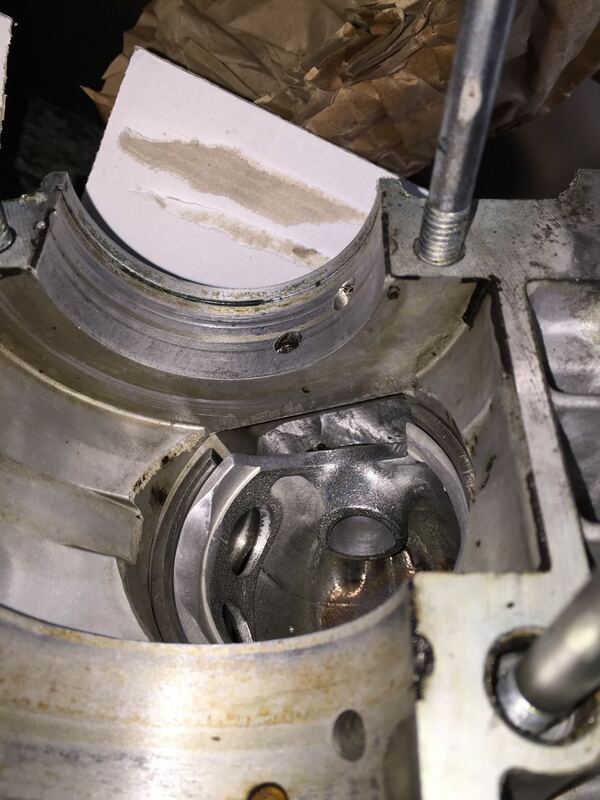 The knocking has completely gone and the piston remains significantly cooler. This can be seen at the lower discoloration of the piston inside the piston crown and the lower oil carbon structure. Typically tuning measures focus on the inlet and outlet port, sometimes on the transfer ports. This brings only 5%. 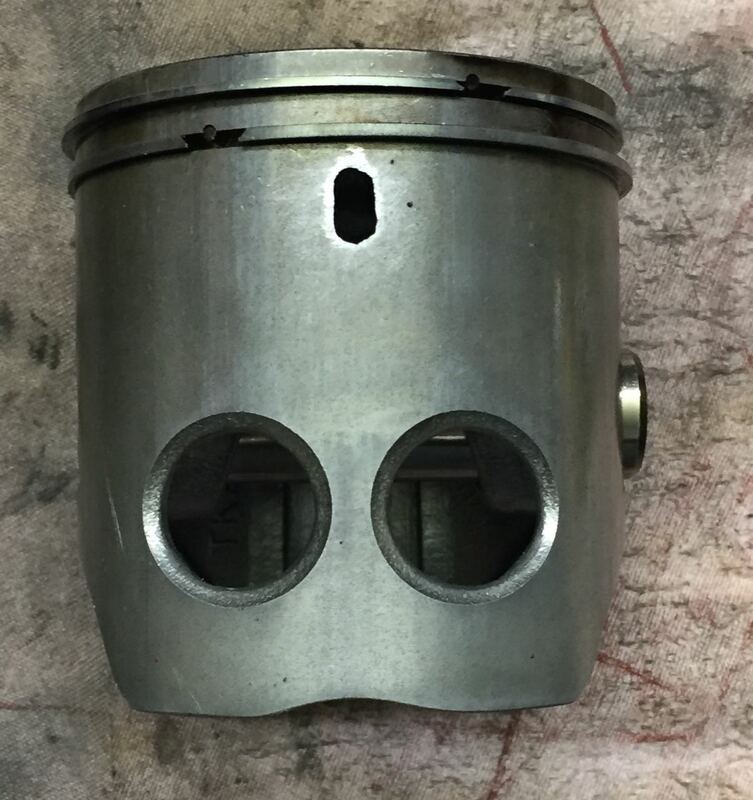 It's much more important to direct the attention to the area below the piston. 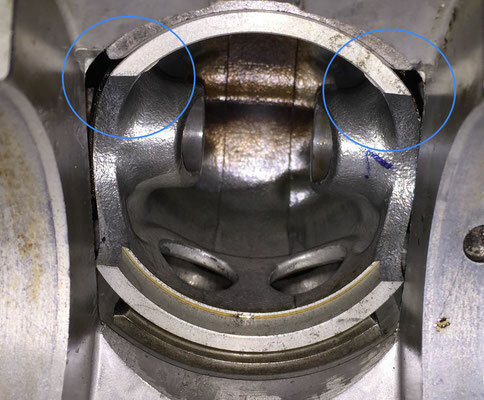 The there located gas isn't predominantly in the piston but between the crankshaft cheeks. This gas must be mobilize. 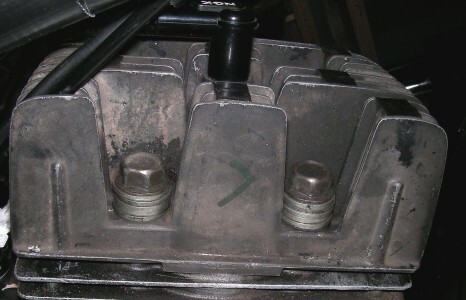 In the above view from the bottom site into the cylinder you can be seen how the piston skirt blocks the small transferports. The big transfer ports have a terrible edge. 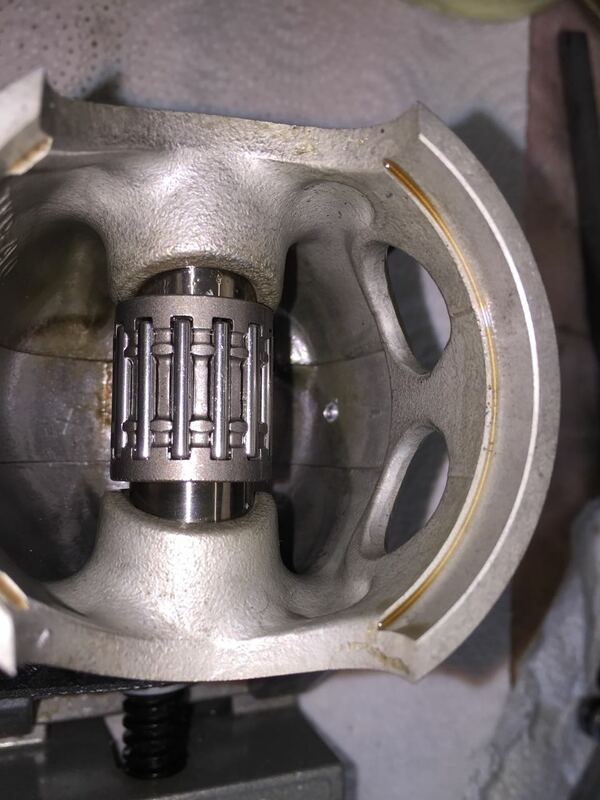 In the rights picture the gas can flow free through the modified piston. 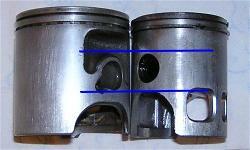 The next picture shows the difference between the standard piston and the modified one. Caution: Be very careful with the modification. Die Ausschnitte des Kolbens sind durch eine Verdickungen verstärkt, jedenfalls bei den Gußkolben. Diese darf nicht geschwächt werden, sonst bricht das Kolbenhemd in Betrieb ab. Die Verbreiterung erfolgt also überwiegend im unteren Bereich, wo die Verdickung endet. Bild: Blick in den Kolben auf die Verdickungen an den Kolbenausschnitten rechts und links. Achtung: Das Kolbenhemd darf auf der Einlasseite keinesfalls schmaler als die Breite des Einlass-Schlitzes werden, sonst kippt der Kolben in den Schlitz. Ich habe 2 mm Überstand auf beiden Seiten gelassen. Der Blick von unten in das Kurbelgehäuse und die beiden Bilder unten zeigen, wieviel mehr Querschnitt der modifizierte Kolben jetzt zur Verfügung stellt. Dem Kolben habe ich eine größere Kühlbohrung spendiert. Damit war Verdichtungen von 1:10,5 möglich. Die Zylinderbuchse und der Kolben werden unten angeschrägt. Was soll das denn habe ich mich zuerst gefragt, aber erinnern wir und, dass sehr viel Gas zwischen den Kurbelwellenwangen ist, dort wo das Pleul läuft. Ohne Anschrägung sieht dieses Gas einen Durchmesser von 56 mm (64mm Kolbendurchmesser minus 2x 4mm Kolbenwandstärke). 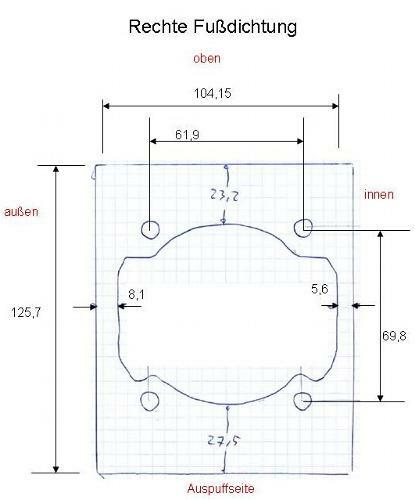 Mit Anschrägung ist es ein Durchmesser von 72 mm also 23% mehr. Die letzte Tuningmassnahme findet an den Stellen der blauen Kreise statt (unten). Hier sind die Kanten der Buchse genau parallel zur Kolbenbolzenachse zurechgefeilt. Dadurch wird die starke Rücknahme des Kolbenhemdes auf der Auslaßseite erst richtig wirksam. Nach diesen Maßnahmen erkennt man den Motor kaum wieder. Das Drehmomen nimme von 3000-6000 1/min kräftig zu, ab 7000 fühlt sich die RD an, als bekäme sie Flügel. Die Luftgekühlten Zylinder leiden darunter, dass sich der Zylinderfuß um den Auslasskanal herum stark erwärmt. Dem wollte ich durch eine zusätzliche Kühlrippe entgegenwirken. Nach längerem Überlegen war die Lösung ganz einfach. Die Kupferfußdichtung, die ich seit Stage 2 verwende, muss einfach größer geschnitten werden. Im Bild kann man gut sehen, wie die Dichtung weit nach vorne und hinten verlängert ist. Auf diese Weise bekommt man eine große Kühlrippe, mit sehr gutem Wärmeübergang geschenkt.